The View Winery has released America's first rosé Pinotage together with its third red Pinotage. The rosé is produced by the saignée method in which juice is drawn off during fermentiion thus leaving a greater ratio of grape skins to juice and resulting in a deeper more intense red wine. The removed pale pink juice is used to make a rose. 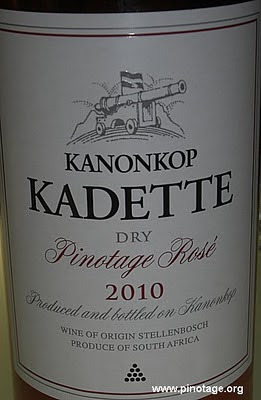 Perhaps North America’s only Pinotage bleed, it’s hard to find anything quite like it. I wouldn’t be surprised to find some copycats in future years. Exhibits wonderful strawberry notes reminiscent of a purely Pinot Noir Rosé, but the pomegranate and cherry are incomparable and addictive! A fantastic Rosé at an even more fantastic price. Don’t disappoint yourself. This will sell-out fast. Much darker in colour than their previous vintage, this Pinotage features lots of red fruits and spice that carries through on the finish. A great food pairing wine (if you are barbequing, this is a must! ), but equally enjoyable on its own. Winner of ‘Finalist’ award at 2010 Okanagan Spring Wine Festival. The View Winery is located at Kelowna, in British Columbia's Okanagan Valley. The 2008 Pinotage featured in The View's must-see video, as mentioned yesterday. 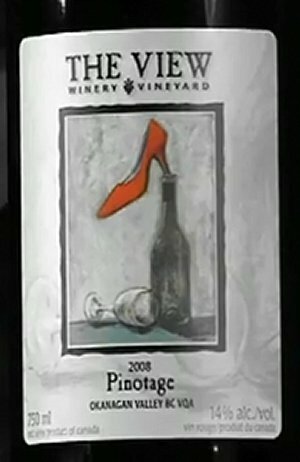 The View Winery’s Red Shoe Pinotage 2008 (left) is featured in this clever and funny film starring Winery President Jennifer Molgat and the Okanagen Valley's winery team. Do watch right to the end. 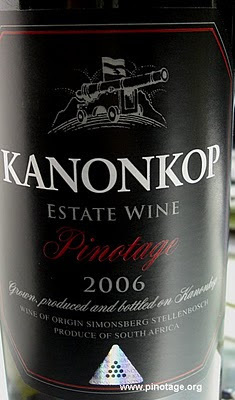 For all the years I have known Kanonkop their range has been limited to four wines, all red. 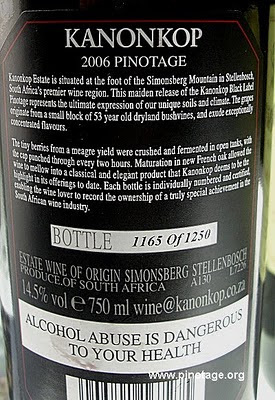 Pinotage, Cabernet Sauvignon, Paul Sauer Bordeaux blend and Kadette Cape Blend. This year has seen two new wines join the team, Kadette Pink Pinotage and the seriously expensive Black Label Pinotage with its hologram logo on thefront and individual bottle number on the back. Thanks to the generosity of owner Johann Krige I was able to taste both at the recent London wine show. I wasn't keen on the pink Kadette 2010 which had too much bubble-gum about it for me but the Black Label 2006l!! Wonderful rich silky ripe deep concentrated plum and bramble berry flavours, perfectly balanced, like an even more refined version of their usual bottling. This is a seriously good wine. I understand this wine is meant for keeping – so speculators can trade it – but it is drinking so well now, a real delight but one few people will be able to drink.